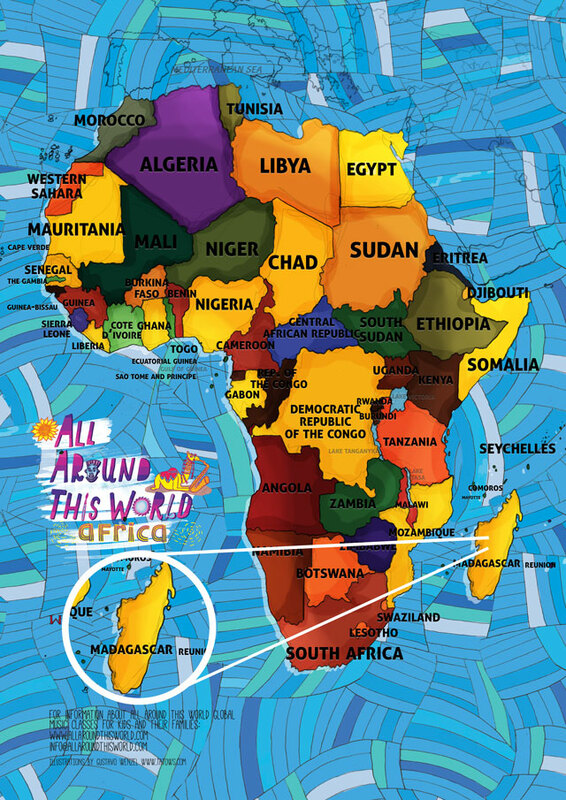 All Around This World’s exploration of Africa includes sing-along, dance-along classroom and homeschool lessons about Madagascar for kids . . . Meet the world through music –“come to class” with Jay. Madagascar, located over 200 miles off the southeastern African coast, is home to a uniquely diverse population that blends Indian, Southeast Asian and African culture, as well as thousands of plant and animal species that only exist on the island — bottle-shaped baobabs, bat-eared aye ayes and ninety-nine varieties of lemur. Wow. In music class we listen to Salegy music, dance the Kilalaky, sing just a little in Malagasy and encourage kids to “wake up” to the problem of Madagascar’s deforestation. — LANGUAGE: As we’ve learned in our travels around Africa with All Around This World, there are almost 2000 languages spoken around the continent; some African countries, like Nigeria, are home to over 500. In Madagascar there is one, . . .
— IMAGES: Flickr.com’s Madagascar slideshow is gorgeous. There are birds and butterflies and dancing monkeys. There are rolling green hills, bright-eyed children on brilliant white beaches and an inordinate number of birthday cakes . . .